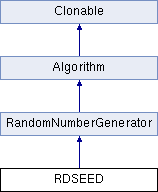 Hardware generated random numbers using RDSEED instruction. Definition at line 102 of file rdrand.h. Empirical testing under a 6th generaton i7 (6200U) shows RDSEED fails to fulfill requests at about once every for every 256 bytes requested. The generator runs about 4 times slower than RDRAND. Definition at line 199 of file rdrand.cpp. Definition at line 205 of file rdrand.cpp. the RDSEED generator discards words, not bytes. If n is not a multiple of a machine word, then it is rounded up to that size. Definition at line 251 of file rdrand.cpp. The operation is a nop for this generator. Definition at line 132 of file rdrand.h. Definition at line 138 of file rdrand.h.